Tim Pruner (left) with Richard Grass, Jr.
Russell Grass Jr., a partner and senior estimator at Waterdon Construction Ltd., has taken the helm as the General Contractors Association of Ottawa (GCAO)’s 2017 president. 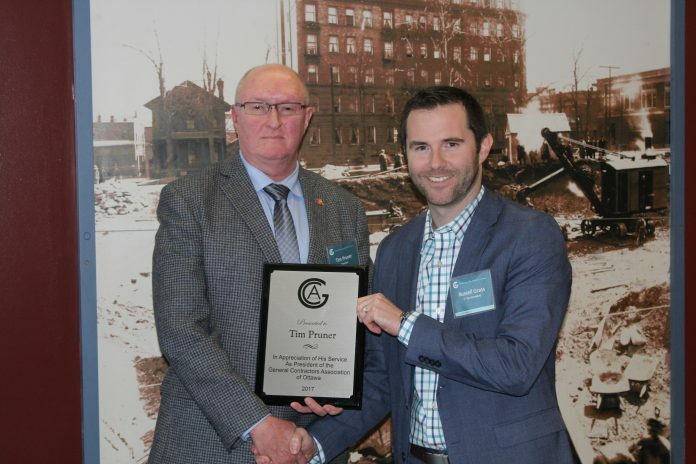 Grass, who in 2017 had responsibility for the GCAO’s most sensitive portfolio – the tendering practices committee – assumes the leadership from Tim Pruner of M. Sullivan & Son Ltd., who continues on the board as past-president. “As we leave 2017 and enter 2018 we reflect on the previous year and see what if any new trends are evolving in our industry,” Grass said in his introductory speech at the GCAO annual general meeting on Jan. 24. “Over the past year, we were still battling with owners over post qualifications, we were seeing more buyers downloading their in-house project management teams to project firms, and we have noticed some buyers have been continuing to insert questionable supplementary general conditions (SGC)s into their contracts. At the meeting, treasurer Chris Fournier reported the GCAO’s accounts are in good order, with a $10,085 surplus after receiving a HST refund correcting a $5,656.91 filing error. The association has $90,348.21 in equity. GCAO’s membership of 61 firms has increased by one from 2016. Directors: Josh Hornung, Ruiter Construction Ltd.; Bruce Norman, PCL Constructors Canada Inc.; Shawn Berube, R.E. 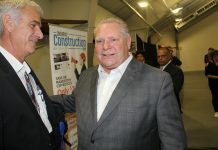 Hein Construction (Ontario); and Troy Gaudet, Ellis-Don Construction.